Split single from the 'Def Jux Vol 3' album. 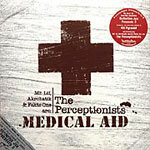 Side A you get bagging cut 'Medical Aid' from The Perceptionists (Mr. Lif, Akrobatik & Fakts One) and on the b-side you get 4th Pyramid with two songs. Heat for '04! Production: 1-4 by Fakts One, 5-8 by 4th Pyramid.